The Faria ROM I have been using for awhile started having issues recently. I was having to soft reset more often (sometimes a couple of times per day), and I couldn’t turn on WiFi anymore. Memory would start at about 21MB and slowly work its way down, though a lot of that is probably due to the applications installed. So I figured it was time to either reflash with the Faria ROM or use another. I settled on another, discussed here at XDA Developers. 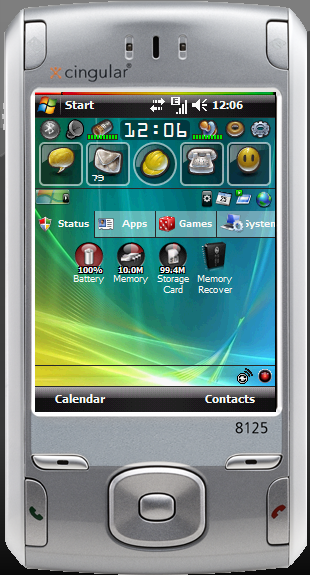 This is a 6.1 ROM, which is nice because of some of the improvements, such as native threaded SMS. I also have more memory after a reset: about 24MB versus 21MB with Faria. Usage feels much snappier, too. I thought that it might simply be because OMAPClock is included, but when I checked it I was still running at 180MHz. So if it feels snappy now, I can’t wait to try it at 252MHz, which is what I normally run at. This entry was posted in Windows Mobile by Scott. Bookmark the permalink.